Expand your inner artist and learn to sculpt clay. Love is in the air ♥ Looking for something to do on Valentines day?! Whether you have a honey boo, need a date night with the girls, or want to come solo. Everyone is welcome to attend!! It's time to get your hands dirty and create your very own plant pot. Final piece will remain at the studio to dry. $50.00 per person, advance ticket purchase required by February 10th. Cost does not include extra firing if you would like to paint your project. Additional cost is $8.00 and can be paid when piece is painted (if selected). 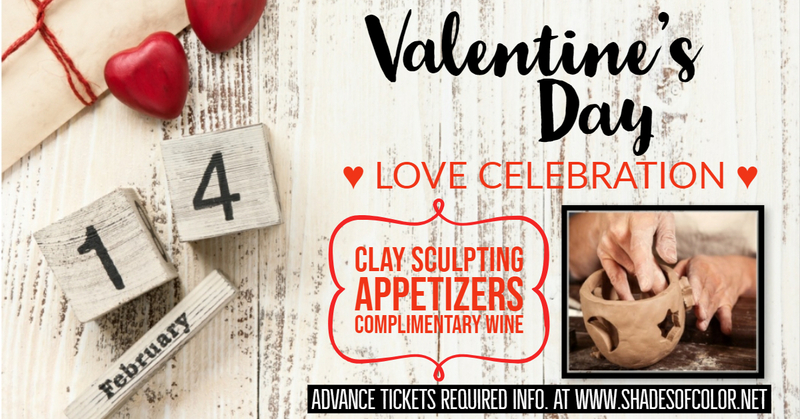 Clay and all supplies included, light appetizers, and one glass of complementary wine included. Feel fee to BYOB- Get ready for a unique sculpting experience!! Cannot be combined with any promotional or discounted offer. Location: Shades of Color Paint 5759 Pacific Avenue #B135 (We are located in Stone Creek Village in the BJ's shopping center) No experience necessary and we provide all supplies. Our instructor will guide you through a step by step process in a 1.5- 2.5 hour session. The event begins promptly at the start time listed above. Please allow extra time to find parking and get settled. Guests who arrive 10 minutes late may be rescheduled for future class. No refunds on any ticket purchases.